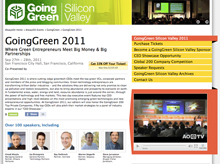 Archive for tag "Khosla Ventures"
Vinod Khosla is a wise man and smart green investor. Originally from India, Co-Founder of Sun Microsystems, Partner at Kleiner Perkins and, since 2004, Founder and Managing Partner of Khosla Ventures, Vinod is probably the most successful Cleantech VC in 2011 with 3 successful IPOs already. Not afraid of taking big risks, ready to fail in order to succeed, focused on the relevance of the Chindia price (unsubsidised price competitiveness in China and India) and self-defining as venture assistant helping entrepreneurs build relevant companies, Vinod is a big role model for me. Now he has even more money to accelerate smart green startups. That’s awesome, dude, congrats to all of us!